Want to know which is the best upright freezer to spend your hard-earned cash on? Whether you prefer to have your fridge and freezer separate or you need another freezer to house all that frozen food (cook ahead frozen or shop-bought frozen, we're not judging), a separate upright freezer is a good investment. While tall freezers can provide plenty of storage for a large family's frozen food shop, under counter versions can be handy for anyone with a small kitchen with limited layout options. Check out our pick of the best upright freezers, and if you're on the hunt for more kitchen appliance recommendations, head over to our hub page. One of the most important things to note when purchasing a new freezer is its capacity. Depending on how many people the upright freezer will be catering for, you can choose from a tall freezer or an under counter model, with tall freezers ranging from 170 litres to around 300 litres, and under counter ones from 60 litres to 100 litres. Tall or under counter? For those who have a big family, we recommend a tall upright freezer to fit all your food in, as it's always best to be sure that you won't run out of space. However, if you live on your own, or need another upright freezer for a few extra bits like ice cream, ice cubes and some of the kids' food, you should probably opt for a under counter version. Because no one wants to manually defrost their freezer every few months, a lot of tall models will have a frost free mode, but it's definitely worth being certain before you buy. If you're thinking of going for an under counter model, don't expect a frost free function, as very few have it, but don't let this put you off, as under-counter freezers are small, therefore much easier to defrost. Not a huge importance for some, but if your upright freezer will be living right next to your bedroom or your living room, it's worth checking its noise output in decibels before you buy. Anything around the 40dB mark or lower shouldn't make any noise that's noticeable. Samsung’s True NoFrost feature is said to totally eliminate all frost and ice by circulating chilled air around the interior. This not only keeps internal temperatures consistent, but it also helps keep food fresh. The digital inverter compressor runs continuously, which is more economical and quieter than standard compressors that switch on and off at various intervals. This humongous 315 litre model is clad in brushed steel which makes it look even more expensive than it is. Inside there are four huge drawers, a small flapped top shelf, two open shelves plus a Slim Ice Maker and a couple of door-mounted trays for smaller items. Buy the matching fridge version and you can put them side-by-side to create one monster American-style fridge-freezer combo. In our opinion, this is the very best upright freezer you can buy. This John Lewis under counter freezer is perfect for small kitchens and smaller households in general. Despite its size, it can still fit up to 78 litres' worth of food. Inside, it has four drawers, and is also frost-free, which is rare to find for an under counter freezer, so you won’t have to worry about ice build-up. There is a ‘quick-freeze’ setting with automatic return that reduces the freezer temperature for a fixed time. This ensures that freshly added food is frozen quickly to preserve its quality, while the food already stored remains better protected. The door can be hinged right or left to suit your kitchen layout. The Hotpoint UH6F1CW.1 will not only look the part in your kitchen, but it'll also play the part, too. Holding 12 bags of food shopping no hassle, this tall freezer is frost free, meaning you'll never have to manually defrost again. Inside, it has six compartments, there's a fast-freeze setting for when you need to cool a large amount of newly-introduce food quickly, plus an open door alert. In terms of style, it's available in white or graphite to match your kitchen colour scheme, and it has a reversible door to fit in with the layout of the room. We think is is the best upright freezer if you're looking for something cheap and cheerful. Looking for a space-savvy solution? Under counter upright freezers are more than half the size of tall ones, and they still manage to fit quite a lot of food inside. This Essentials CUF55W18 model by Currys has three drawer compartments so you can organise your food how you like, the door is reversible to suit your kitchen layout and it has an energy rating of A+. The best part is that it has a very spacious 102 litre capacity, so if you'd like a large upright freezer, but don't have the vertical space, this under counter model will do. 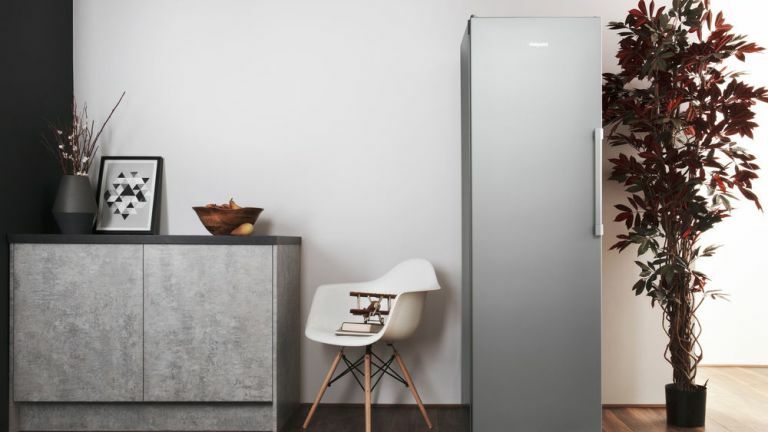 For anyone who has a retro kitchen, Smeg products are a must-have, and this tall freezer is no exception. The sleek design and choice of black, cream or red means it would suit any style of kitchen beautifully. What’s more is that this is one of the larger freezers on the list, ideal for those who like to do a big shop. You will need to manually defrost this freezer every now and then if ice builds up, but other than that it works like a treat and looks right at home in spacious modern kitchens. This Smeg offering is easily one of the best upright freezers for style on our list with the added bonus of a matching fridge available in the range. Ideal for those who live by themselves, this Electra under counter freezer is compact in size, but it doesn't lack in features. It has an efficient energy rating of A+, three clear drawers to see and separate your food and the door is reversible to suit your individual kitchen layout. It comes in black or white and, at just 48cm wide, is perfect for small kitchens. Our pick of the best upright freezer if you're after something compact.